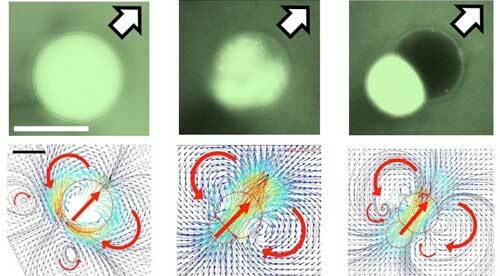 (Nanowerk News) In the life sciences, researchers are working to inject drugs or other molecules into a human body using tiny “transport vehicles.” Researchers at the Saarland University and the University of Barcelona have shown in a model system that small emulsion droplets can be used as smart carriers. They have developed a method for producing self-propelled liquid droplets capable of providing spatially and temporally controlled delivery of a “molecular load”. The study was published in Communications Physics ("Spatiotemporal control of cargo delivery performed by programmable self-propelled Janus droplets"). “Starting point are homogeneous droplets, which are produced from a water-ethanol mixture. These droplets swim in an oil phase in which a surfactant is dissolved,“ explains Jean-Baptiste Fleury, who is a group leader at the department. In the first development phase, ethanol exits the droplet and dissolves in the surrounding oil phase. This results in different tensions on the surface of the droplets, which cause the so-called Marangoni flow on the surface as well as in the droplet. At the same time, surfactants from the oil phase migrate into the drop; because they want to surround themselves preferentially with the ethanol contained therein. Finally, water and ethanol segregate and small droplets of ethanol-surfactant mixture form in the drop, which quickly merge and, due to the flow within the droplet accumulate at the rear end. At the end of stage two, a characteristic Janus drop has formed. In the following third stage, the surfactants on the surface of the water-rich drop are still “sucked off” by the rear, ethanol-rich drop, and the surface tension at the rear part of the surface is increased. This gradient causes the liquid on the surface of the front drop to flow into the direction of the higher surface tension and thus sets the entire Janus drop in motion. “In the course of their formation, the Janus droplets exhibit specific driving mechanisms; moreover, they result in different flow fields in the respective stages”, says Dr. Brinkmann. The researchers from Saarbrücken have precisely explored the motion of these Janus droplets. “We can observe how they move in the experimental cell during their development, which lasts about ten to fifteen minutes, and how they interact differently with obstacles, depending on their evolution stage,” explains Dr. Fleury. The length of the individual stages of development can be controlled by the initial ethanol concentration in the droplet and its size. In order to test their abilities as carriers, the droplets in the experiment were also loaded with DNA molecules as cargo, which accumulate in the ethanol-rich phase. “Our carrier can selectively walk along obstacles of a specific geometry and surface condition and also deliver its cargo in a targeted manner,” says Prof. Seemann, summing up the results of his work group. Thus, the study describes a first but simple example of a programmable active carrier capable of performing spatially and temporally controlled cargo delivery.